In some of the scenes, the claustrophobic captivity of the submarine comes over very vividly. The characters are a bit simple, though, and don't develop. The ending also isn't too my liking - a more subtle (and less ex machina) point could have been made. Provisional rating. Got suckered into watching the dubbed version. Ugh. So distracting to hear garbled English instead of German. Will watch the proper sub-titled version eventually and re-score. For context I watched the 293 minute version (nearly 5 hours), and was somehow convinced to watch the dubbed instead of the subbed. Surprisingly the dubbing is good at times. It helps that a lot of the cast is bilingual and did their own dub. The beginning and ending are pretty good, really slow in places, but very well made for 1981. I may check out the subbed Theatrical (2 1/2 hours) and/or Directors Cut (3 1/2 hours) to see if the pacing is better. 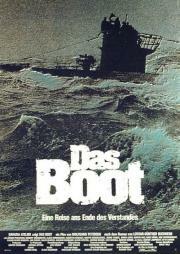 Haven't seen lots of WWII films from germans perspective but this is for sure one of the best.